I'm back from our first and long overdue vacation since I started working. Imagine sleeping while everybody's revelrying on Noche Buena. 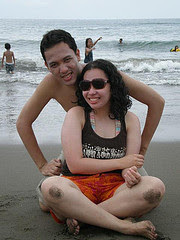 My family spent the Holy Week in Bicol or now better known as CamSur. It was a week of relaxation away from Manila's scorching daytime heat, impossible traffic and work stress. It was also a break from the vicious cycle of dvd and youtube marathons, 24 hour fastfood diet and 24 hour drinking spot raids. We did the traditional round up of old friends over beers, binged on ALL our food cravings and of course, swimming! The Medenilla Clan had a reunion at the Ecogarden pool in Capitol. It was also a chance to hang out in CamSur Watersports Complex that boasts the cheapest ($2 per hour) cable ride in the world for wakeboarding, waterskiing, kneeboarding etc. I was really impressed by the place, didn't have the chance to try it though because it was packed with locals and tourists. 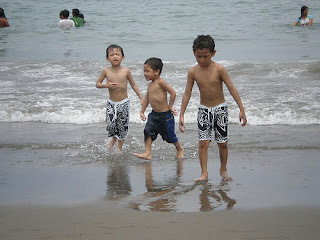 The next day, we hit the beach in Nato and was beaten and slammed by the raging waves. I was trying to get a tanned skin for summer but thanks to the cloudy skies nobody noticed! LOL! God! I've forgotten how laidback and fun my hometown is. I missed it so much! We have so much to look forward to that I can't wait to return again. In the meantime back to reality working as zombie drones again.